Japanese lawmakers expressed their commitment to passing comprehensive legislation prohibiting organ transplant tourism during a recent meeting at the National Diet. 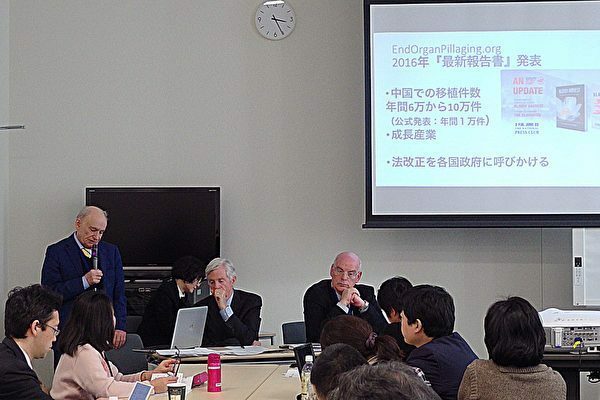 On Jan. 23, a panel on medical genocide was held at the National Diet Building with Canadian human rights lawyer David Matas, former Canadian Secretary of State for Asia-Pacific David Kilgour, and Dr. Jacob Lavee, president of the Israel Society of Transplantation. 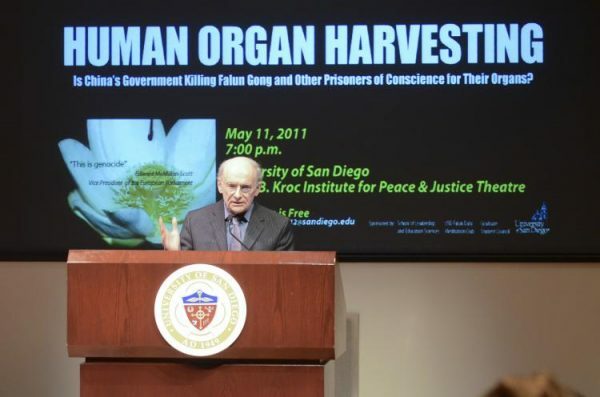 Matas and Kilgour have investigated the phenomenon of forced organ harvesting in China for over a decade, revealing China’s state-sanctioned system of extracting organs from prisoners of conscience and then selling the organs for profit for transplant surgery. Their research indicates that most of the prisoners, who are killed in the process, are adherents of the Falun Gong spiritual practice, a meditation-based discipline that has been severely suppressed by the Chinese regime since 1999. Patients in desperate need of an organ transplant have increasingly traveled to China for surgery, where they report being able to procure a matching organ within weeks or months—far shorter than the waiting period in their home countries based on organ donations. But medical tourists have unwittingly contributed to China’s dark organ harvesting trade, where the quick turnaround in scheduling transplantation operations is due to the state’s killing on demand, Matas and Kilgour have found. The two, who have co-authored several studies on China’s forced organ harvesting, estimate that transplant volume in China may have reached tens of thousands annually since the year 2000. They report that the most likely source for the majority of these organs are detained Falun Gong practitioners. The panelists spoke to Japanese lawmakers about the dangers of medical tourism and raising awareness about voluntary organ donations—which have historically been limited in Japan (and China, for that matter) due to cultural customs of leaving the dead intact. 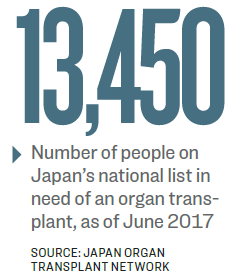 According to the Japan Organ Transplant Network, up to June 2017, the national list of those in need of an organ transplant reached 13,450. Japan currently has laws prohibiting the buying and selling of organs but has not yet placed a ban on citizens traveling abroad for organ transplant surgery. Taiwan, Norway, Chile, and Israel have passed laws limiting their citizens’ ability to receive organ transplants abroad, citing concerns about unknown sourcing in the organ trade. In Israel, any monetary transaction of organs, within or outside of Israel, is banned, whereas in Taiwan, doctors can still refer patients to overseas hospitals that acquire organs through legitimate means. However, doctors are required to file a report and conduct follow-up treatment for all patients who receive transplants overseas. Hospitals and doctors who do not file reports or are found to have filed false reports will be fined and charged. Patients found to have acquired organs through illegal means face up to five years in prison and a monetary fine. Dr. Lavee, the Israeli heart transplant surgeon, said that though China claims to have stopped accepting overseas patients, the reality is that many from North America, Europe, and countries in Asia continue to travel to China for transplant surgery, according to Sound of Hope Radio. He also noted that Israel, like Japan, has cultural taboos against organ donations, but in recent years, public awareness campaigns and incentives for living donors have dramatically increased the number of donations. “Beginning with Japanese people with good conscience, we need to work with those who share the same values, stand up together and stop this from happening,” Kiuchi added. Ishibashi Rintaro, a representative from Hiroshima, said he will tell people in his hometown about this atrocity, while Hiroshi Yamada, member of the upper chamber, the House of Councilors, said Japanese people cannot be “accomplices” to China’s crimes. 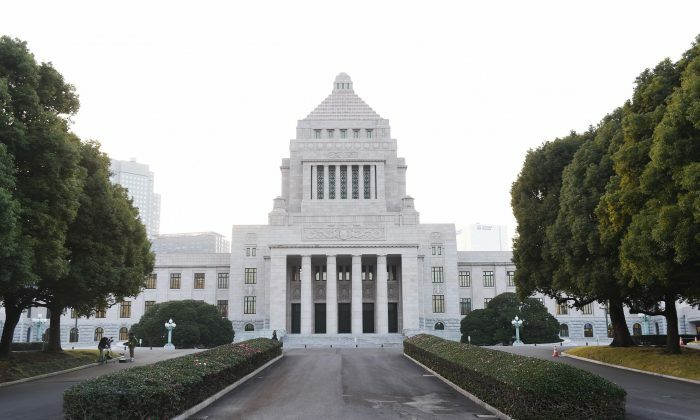 Yamada helped organize a conference inside the Diet building in December 2017, where Matas and Kilgour explained their study’s findings to members of the public, media, medical experts, and government officials. The conference built on media attention to this issue after Japanese newspaper Sankei Shimbun published a report in July 2017 about Japanese medical tourists who traveled to China for transplant surgery. Months later, in October, a group of Japanese journalists formed the Caution Against China Organ Transplant Association, aimed at stopping Japanese transplant tourism. The January panel was the association’s first organized event.